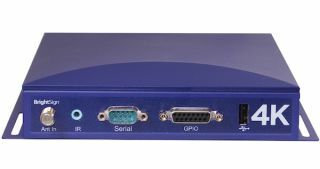 Brightsign has debuted its new 4K digital signage media player this week. While a handful of niche players claim 4K support, BrightSign says that its new player delivers an end-to-end 4K solution that accepts H.265-encoded content and delivers 60 fps output via HDMI 2.0. Each of these characteristics is necessary to deliver a true 4K solution, according to Jeff Hastings, BrightSign CEO. 4K in the digital signage market has been met with much enthusiasm, as well as some confusion about how to deliver “true” 4K. For content to remain 4K native and be delivered at the highest visual quality, video must be captured on a 4K-capable camera, encoded and decoded using the new H.265 compression standard at 10 bits/channel, and fed to the display via HDMI 2.0 to preserve the original 60 fps frame rate. Any broken link in this chain of events adversely impacts video quality and the output falls short of what 4K is made to be. Elemental Technologies supplies the encoding horsepower required to deliver a true 4K viewing experience. Elemental is the first to implement the HEVC specification with the capability of processing 4Kp60 H.265 content in real-time. The company’s award-winning work in HEVC video processing helps BrightSign create the high-quality viewing experience available with its new player. True 4K output possesses two primary characteristics; a resolution of 3840x2160, and a frame rate of 60 fps. The BrightSign 4K is the first player of its kind to successfully playback both.